I just had to fussy cut the birds. How very cute. You have a tremendous amount of patience. Adorable flowers, especially the birds. I like your fabric choices. Oooh, your hexagons are lovely! I really like the tone-on-tone colours with the fussy cuts! That is going to make a beautiful piece of art! The birds are wonderful! All three flowers look excellent together. Beautiful fussy cut petals on your flowers. Too cute! What lovely flowers you have. It was worth the fussy cutting. Beautiful flowers!! I especially like the fussy cut bird flower! 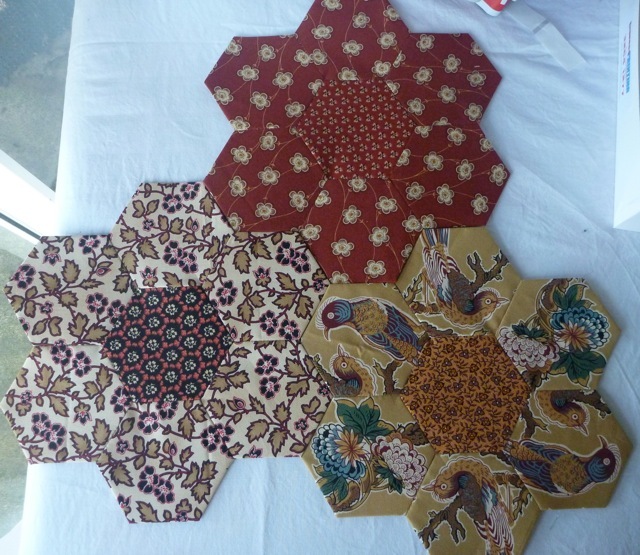 Gorgeous hexies. I know what you mean about them being addictive! !